Ant Man, Cinderella, Into the Woods and Star Wars: Episode VII are some movies that Disney/ Pixar will bring this 2015. This 2015 the makers of Mickie Mouse and company will invest millions of dollars in major motion pictures after acquiring the rights to Marvel and Star Wars, Disney would be one of the leading film companies in the industry. 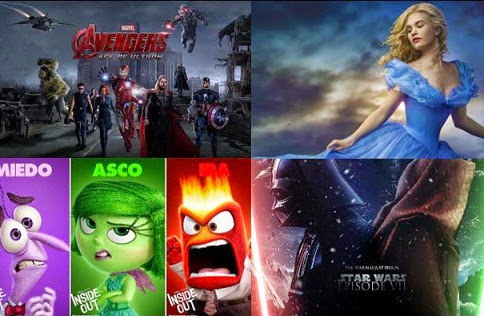 Disney has behind its curtain premieres expected either action, science fiction, adventure, comedy and animated films. Inspired by the true story of 1987, following in the footsteps of McFarland novice runners who form a Cross-Country team under the direction of coach Jim White (Kevin Costner), a newcomer to the Latin school, who form a bond not only to compete in a championship, but also to forge a strong legacy. The most famous story of fairy tales this time hits the big screen starring actors of flesh and bone, such as Lily James in the role of Cinderella, Cate Blanchett as Lady Tremaine and Helena Bonham Carter who will play the fairy godmother. Disney Nature, made a new documentary with the help of the directors Alastair Fothergill and Mark Linfield, who closely follows a family of monkeys who are forced to leave has always been his home in a jungle of Asia. The sequel to the superhero movie is back. This time Iron Man, Captain America, Thor, Hulk, Black Widow and Hawkeye, are tested as the fate of the world hangs in the balance. Riley is guided by her emotions, which take life inside her head and become only friends; well, joy, fear, anger, disgust and sadness come alive to enjoy an extraordinary adventure. The musical "Into the Woods" tells the stories of Cinderella, Red Riding Hood, "Jack and the Beanstalk" and "Rapunzel", joined by the original story of a baker and his wife who want to start a family, and interaction with the witch who casts a curse on them. Frank (George Clooney), who was a child prodigy but now weary of so many disappointments, and Casey (Britt Robertson), a bright and optimistic teenager full of scientific curiosity, embark on a dangerous mission to unlock the secrets of an enigmatic place Somewhere lost in time and space known as 'Tomorrowland'. Equipped with the amazing ability to reduce his size but increase his strength, the master thief "Scott Lang" should embrace his inner hero and help his mentor, "Dr. Hank Pym "protect the secret that hides behind his spectacular costume" Ant-Man "for a new generation of imposing threats. What if the dinosaurs were not extinct? The animated "The Good Dinosaur" suggests that these enigmatic beings never left this world and also live together with other living beings. I really admire Disney movies and their music. What would a Disney movie be without the fantastic music? The music from frozen games to play helps get you into the story and away from life. Fun songs like Hakuna Matata are pretty effective in breaking the tension.